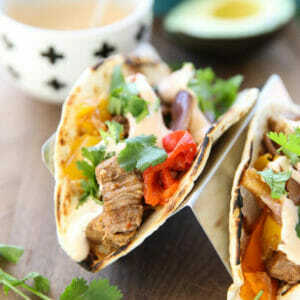 No fuss fajita recipe with tender steak strips and easy veggies, where everything is tossed in the slowcooker. Cut flank steak against the grain into about 1/2-inch slices. Then slice the opposite direction so you have 2-3-inch strips of meat. Place in slow cooker. Cut peppers and onions into large 1-inch strips and place on top of meat (see note below). In a small bowl, combine 1/4 cup lime juice, soy sauce, liquid smoke, vinegar, chili powder, cumin, garlic, salt, and pepper. Whisk to combine and then pour over meat and veggies and toss to coat. Place lid on cooker and cook 4-6 hours on high, or 7-8 hours on low. While meat is cooking, whisk together sauce ingredients and store in fridge till serving. When meat is done, optionally squeeze a little more lime on top and toss in a handful of chopped cilantro. Tender vegetables like onions and peppers get very soft when cooked this long in a slow cooker. I personally like it that way, but if you prefer more bite to your veggies, simply toss them in about half-way during cooking time.